The holidays can bring many unique challenges for those grieving over the loss of a loved one by suicide. Here are some tips to help get you through. Hannukah, Kwanza, and Christmas: These deeply personal and family-tradition oriented holidays can bring to the surface many difficult thoughts and emotions. Much emphasis is placed on continuing tradition and familiarity during these end-of-year events. Be prepared for the possibility of feeling your loss quite sharply. Be prepared for family and friends and coworkers to be focused on their own “happy holidays” and try to remember their joy is not a rejection of your grief. Often during this season, our pain can seem so much more incongruent with the world of festive decorations and familiar gatherings and what seems to be the devastating ignorance of the entire world to your loss and mourning. Be prepared for everything from possibly ham-handed condolences, to outright avoidance of the topic of your loved one by others. More people than we wish to give credit to, feel our loss but don’t have the slightest clue how to avoid upsetting us. So many people avoid it-and sometimes us altogether, perhaps thinking they are doing us a favor by not “taunting” us with their joy. It may be hard but we should try to forgive them that ignorance. 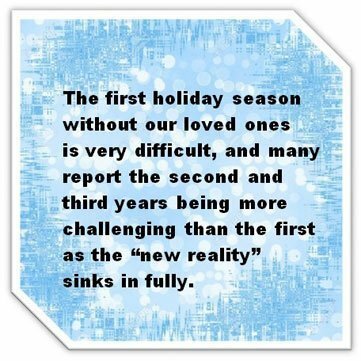 The first holiday season without our loved ones is very difficult, and many report the second and third years being more challenging than the first as the “new reality” sinks in fully. DO: Let those close to you know that while you are still grieving, you would like to be a part of their festivities despite your current emotional limitations. Make plans and follow through on them (if you can). Adjusting to life without your loved one there during these holidays is a drastic break in reality and it is important to acknowledge that. Do be honest with people in that the loss has made you lonely and you are seeking to incorporate and alleviate some of that because everyone can understand that feeling. Try asking friends and family for weekend lunch dates to talk or movie nights or board game gatherings, in place of another pair of festive socks or an ugly sweater. Use your loved one’s name, and let people close to you know it’s okay to talk about them. Being able to share stories of holiday seasons past with our present loved ones, can help make those lost, a part of this year’s celebrations too. Talking about them in a positive way can also help those near us that we care about to participate in the grief. Sometimes people we love also miss our departed but don’t feel comfortable speaking up first―because you were closer to them. Give them that permission and gift of remembrance to share. TRY NOT TO: Cling to the past. Our grief is with us every day, but annual events like a big holiday remind us of the past like a time capsule, which can make us feel like we lost them only the day before – all over again. Recognize the past, and if it is right for you, continue old traditions that involved your loved one. Try to anticipate the memories. Consider starting new traditions to add to the holiday season as soon as you are comfortable. For example, my loss (Brian) used to wonder if all the lone shopping carts we see in strange places were just lost or got caught taking a walk and had to freeze because we were observing them. So around the holidays now, I go out of my way to drive around in the middle of the night and find a few to bring back “home” to their rightful place so they aren’t lonely during the holidays. Think outside the box with your traditions, but try not to either continue on as though your loss did not occur, or cease all festivities entirely. It is okay and less jarring to ease in and out of traditions and festivities. Do not presume you can no longer enjoy yourself. Your loved one would rather see you working towards being at peace with the world, yourself, and them―and growing and moving through.